Hands-down, this is my most requested recipe. When I teach cooking classes, I usually bring a bodacious veggie platter with this sauce, and every time, folks are clamoring for the recipe (which I’m always happy to share). 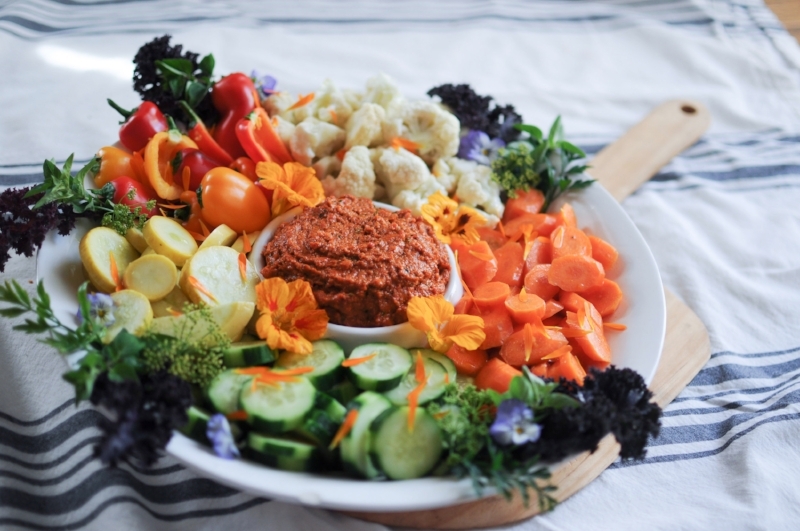 I definitely can't take credit for the creation of this dip... Romesco is a traditional almond + roasted red pepper based sauce that originated in the Catalonia area in Spain. The recipe is as easy as putting all the ingredients in a food processor, and it is fabulous with just about everything - from toast to crudité platters, roasted veggies, sautéed greens, as well as alongside chicken and seafood. I dare you to make this sauce and not fall in love... keep scrolling for the full recipe. This traditional Spanish sauce comes together in a flash in a food processor, and it makes everything that it's paired with taste fabulous. Using a small food processor, first process the garlic and almonds until they are finely chopped. Add the remaining ingredients for the sauce and blend until smooth, scraping the sides of the bowl between blending. Taste and adjust seasonings as needed.